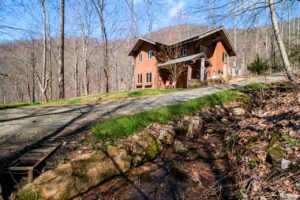 We’re pleased to offer this new totally off grid home located just 30 minutes from downtown Asheville here in the western North Carolina mountains. This property has never been connected to the grid. It gets its power from a combination of solar power and micro-hydroelectric power. The 33 acre property has thousands of feet of rushing mountain streams that are sourced on the adjoining 13,800 acres of USFS lands. That’s right, this property adjoins 13,800 acres of forest land. How’s that for privacy? Yet its a very easy drive to civilization on a paved road through the valley. The property itself is situated at the end of a long private gravel drive with not another house in view. The house is a masterpiece of craftsmanship. The owner is a furniture builder and it shows in the joinery of the woodworking. Simply beautiful. Radiant floor heat is provided by a wood fired boiler. There are two large fenced gardens, a large chicken coop, mechanical building and a spacious green field for more agriculture, livestock or recreation. The water comes from a spring right out of the mountain face with so much pressure that reduction valves had to be installed to keep the faucets from blowing up! Click here for the full listing. This is an exceptionally high quality home in a lovely setting, ideal for anyone looking for a bugout property or sustainable homestead. Call us today for a private showing.